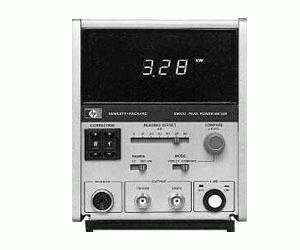 The Agilent 8900D power meter directly displays the peak power of RF pulses over a 100 MHz to 18 GHz frequency range. Measurements can be made on pulses with widths from 1 µs (100 ns in compare mode) to CW, and repetition rates from 100 Hz (0 Hz in compare mode) to 100 kHz. The 8900D has a high-resolution 3 and 1/2 digit digital display calibrated in watts. The direct reading display and range annunciator make the digital version a good choice for productions and field applications where unambiguous or frequent readings are required.